Back in the Hobby—Limbochromis robertsi by Anton Lamboj. One of Anton’s favorite West African cichlid, now back in the hobby! Studying Neolamprologus pulcher in the Field by Jennifer O. Reynolds. Behavioral observations on a favorite Tanganyikan cichlid. A New Eartheater from the Alto Rio Tocantins in Brazil by Oliver Lucanus. The title says it all… and it’s spectacular! The Husbandry of Myaka myaka Trewavas 1972 by Paul V. Loiselle. Dr. Loiselle discusses his recent experiences with the smallest of Lake Barombi Mbo’s endemic cichlids. Recent Human Impacts on Lake Tanganyika by Mireille & Jacky Schreyen. An update on the distressing environmental conditions in the lake. Book Review by Laif DeMason. 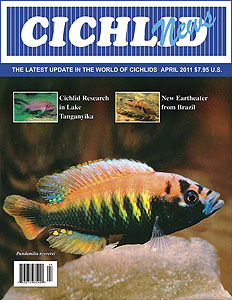 Laif reviews Cichlids of Africa, Vol. 1: Haplochromines. My Favorite 6 Cichlids by Pam Chin. We happily reinstate this series with a contribution from the author of ‘Ask Pam’. Editor's Note: This issue is no longer available.